Rotherham-based sign specialists, Signs Express, has won an exceptional three awards at the company's national sign awards recently. Signs Express, the UK's largest sign and graphics company, recognised the incredible work the Rotherham based sign company produces. 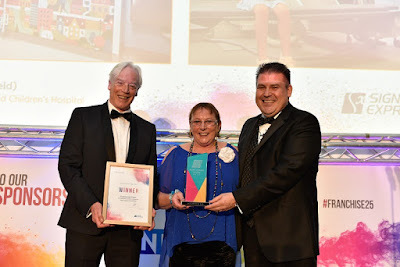 The brand has over 65 centres across the UK and Steve and Carol Morris, owners of the Rotherham based Signs Express, were the big winners of the night, walking away with three awards whilst also being named as finalists for Best Sign Project, Best Vehicle Graphic and Most Striking Design. Based at Templeborough, Signs Express (Sheffield) pride themselves on their expertise and innovative solutions to help businesses come up with perfect signage solutions, tailored specifically to their requirements. In February 2004, Steve and Carol Morris opened their fully equipped sign making centre in Rotherham, since then, they have expanded their territory to include all of Sheffield. The long-established centre won Best Interior Sign for their incredible work within the Fluoroscopy Department at Sheffield Children's hospital. The centre has completed a great deal of work with The Children's Hospital Charity, Artfelt, who works with local artists to transform the walls and spaces with bright art to provide distraction during anxious moments and to help children recover in an environment tailored to them. Steve Morris (pictured, left) said: "Our surroundings can have a powerful effect on how we feel, which is especially important in a hospital where the environment can influence well-being and comfort for patients. The fluoroscope itself can be very intimidating which can add to the anxiety of seriously ill or injured children and their parents, so it was a great pleasure for us to be able to transform this space with colourful wall graphics." The pair were also presented with the Best Exterior Sign award for an impressive installation on behalf of Bombardier at Biggin Hill. The new signage comprised of built-up powder coated aluminium letters with white LED halo illumination. Plus, their sign maker James Stuchbury, was named as Employee of the Year. Signs Express employs in excess of 400 people across the country. The win comes after James was recently named as a finalist in the British Sign & Graphics Association Young Sign Maker of the Year award.